The king of making lawns and gardens beautiful in Muskoka, Barrie, GTA, Wasaga Beach and the Southern Georgian Bay area! We’ve been working with sprinkler systems for over 20 years now and know exactly what works best. Contact Us Today! 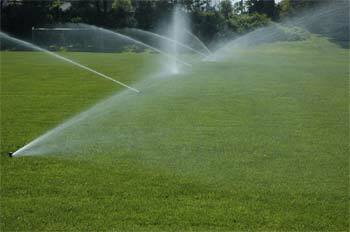 At Sprinkler King, we want to know how many times you’ve forgotten to water your lawn, then over-watered it to make up for the lack of water. We’re proud to serve homes, cottages, and commercial locations and are proud to offer Hunter and Toro sprinkler systems. Your home’s landscaping adds depth, beauty, and appeal to your property At Sprinkler King. We install irrigation systems throughout Wasaga Beach, Muskoka, Barrie, and elsewhere in the GTA and know that we can help you achieve a beautiful lawn with our solutions. 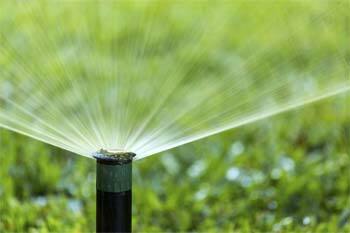 Let us put new sprinklers in your yard so you can enjoy finally having a lush, green lawn. Is your lawn dried out and filled with unsightly brown patches? Do you feel like you water your lawn all the time, but it never wants to turn green? Are you tired of seeing your neighbours enjoying their lush, green lawns? Don’t deal with any of these situations any longer—instead, get in touch with us at Sprinkler King! We are a sprinkler repair and installation company that serves Wasaga Beach, Muskoka, Barrie, and the rest of the GTA. With over 20 years of experience working with sprinklers, we know exactly what it takes to get your sprinkler system up and running like it should, so you can finally have the lawn you’ve always dreamed of. Save time. Save money. Save water. Contact us at Sprinkler King today to find out how we can make this happen! We can’t wait to introduce you to all of the sprinkler systems we have to offer and to help you get rid of common sprinkler problems once and for all. From sprinkler repair to sprinkler installation and even Landscape lighting, we do it all in Wasaga Beach, ON and surrounding area! When you think about irrigation, you probably envision farmers watering their crops. However, the principles of irrigation can be applied at your home, your business, or your cottage to help you achieve a lush, green lawn that all of your neighbours will envy. We’re proud to serve homes, cottages, and commercial locations and are proud to offer Hunter and Toro sprinkler systems. Both of these brands provide years upon years of use and are designed to take the hassle out of watering your lawn. Your home’s landscaping adds depth, beauty, and appeal to your property At Sprinkler King, we believe you shouldn’t only be able to enjoy your landscaping when the sun is up! 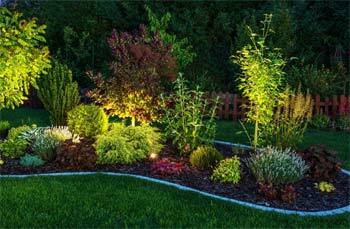 For this reason, we are proud to offer landscape lighting services to our valued clients. Save Time. Save Money. Save Water. Wasaga Beach, Simcoe County, Muskoka, Barrie, Thornbury, Collingwood, Orillia and Southern Georgian Bay!